From A Basement On The Hill works better for me (at least the songs are more fleshed out-again, not a criticism of “Candle” as those songs were never meant for a true release), though again, here we have something not intended to exist in the form it was released. 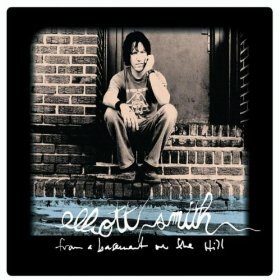 The sixth studio album from Smith, the “Basement” songs lie incomplete at the time of his death, some 30 songs in all Smith planned to release as a double album, but his former producer and girlfriend got these 15 tunes together and the record company agreed to only a single release. Tunes like opener “Coast to Coast,” “Pretty (Ugly Before),” and “Don’t Go Down” benefit from the fuller band treatment. Again I feel Smith channeling Sid Barrett on tunes like the title track, sometimes John Lennon on “Let’s Get Lost” and even T-Rex on the very melodic “Don’t Go Down.” For me, “King’s Crossing” with its weird vocal and the best lyrics of the fifteen, plus it’s infectious chorus, made it my favorite. We get some weird noises opening “Shooting Star,” probably the most out and out rocker on Basement, and another great tune, though it kind of peters out near the end, but Smith redeems on “Memory Lane” with just his vocal, electric and a jaunty lyric, it’s at moments like these that you realize the man really did have something to say and a neat way of saying it. “Little One” is nearly a lullaby (in Smith’s weird way) and the sardonic, “A Distorted Reality Is Now A Necessity To Be Free” ends the whole proceedings.